With hundred of products being unveiled over just a few days, it’s hard to really capture the limelight at Europe’s biggest mobile exhibition, however Samsung was one of the more dominant brands to emerge from Mobile World Congress with its Galaxy S5 leading the campaign. 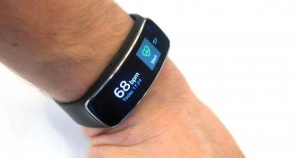 The South Korean company also previewed its latest wearable products in an attempt to shift away from the Samsung Galaxy Gear – which was released only about six months ago. The new ranges of smart devices are simply called Gear as Samsung try to keep the Galaxy brand separate to smartphones and tablets. Most must have thought that two Gear smartwatches would have been enough for the technology giant, but no they surprised attendees with a third product which specifies itself to a more niche market. The Samsung Gear Fit is there latest wearable fitness tracker completing a full range of product releases from Samsung this spring. The product boasts a 1.8-inch touchscreen wriststrap, which has the ability to track your heart rate, calculate steps taken, calories burned and distance travelled and is all stored on the product meaning no pairing devices are required. The product promotes itself as accessible due to the fact you do not need a phone to pair with, however if that is a possibility you have the opportunity to unlock a much more enhanced product as you can control such things as incoming calls, texts and emails as well as music navigation whilst working out. All these augmented extras are great for a product like this in a crowded market but don’t really offer anything new, which cannot already be bought with popular competitors. That’s why Samsung decided the Gear Fit would start to not only record your activity, but also encourage it. The new device alerts users when they have neglected their workouts and aims to get them moving.